But no one who struck me the same way. Before I had anything to say. While my things are still packed. When you planted your lilacs. Inside jokes on the side. In those bittersweet car rides. That speak the truth of it. To make the right impression. In this midnight poetic confession. ...Let me put it this way. I’m still willing to try. That I care and why. Because you’ve been on my mind. And I’d do anything to make it my sight. I want to take your hands. And make with you our plans. And so is the morning sun. Makes the wind go still. I feel my mind sway. Leading me to where you are. But I hope everyday there’s just enough time. Winds dusting your window chimes. 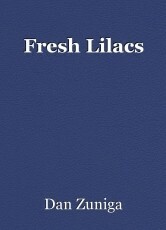 Near the scent of your fresh lilacs.